Today, let’s talk about Panama City Beach, specifically the Condominium Sector. As a student of the marketplace, it is imperative that your appraiser is in tune with today’s marketplace. We all know that various projects will attract prospective buyers based on project amenities, age, and unit design. Do you think your clientele would be interested in knowing the performance of a particular project over time, especially if considering a condo unit as an investment? The charts below put this into prospective. If a buyer is looking at the 5 condo projects shown below, could this information be useful to them in their selection process? I think so. As the saying goes, a picture is worth a thousand words. The five projects considered in this analysis were limited to gulf front complexes and is based on two bedroom units in order to provide a clean sampling. 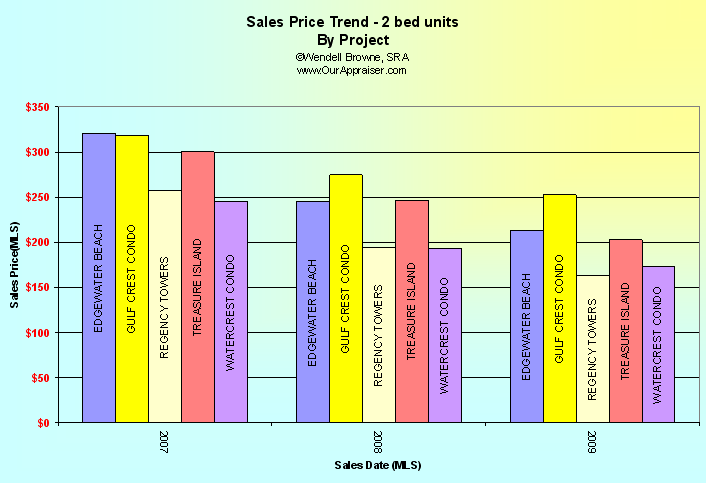 The data sample reflects unit sales through May of 2009. Of course, all five projects have declined year over year during the trend period; although some performed better than others.